This is the second painting I did on Thursday very quickly as you can probably tell! I love the way the yellow of the dresses turned out on the black canvas which is actually an old painting I didn’t like that I repainted black over so I could experiment with a black canvas. I couldn’t figure out how to get the images of the sketches onto the black canvas, though, so I had to eyeball them. That’s why the arms turned out funny on the third figure! Her right arm is quite long! 🙂 Also, I only did three of the sketches I had. The fourth figure is in the watercolor painting I already posted. This was another learning experience for sure! My daughter loves this one, and after a while I have come to love it also. Have a wonderful day, and give someone you love a big hug! 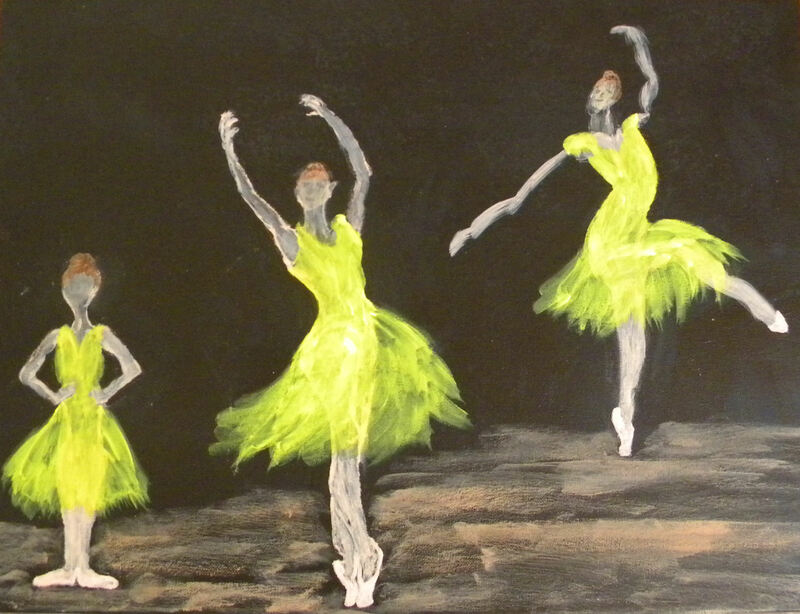 Posted on May 11, 2015, in Art Talk, Watercolor Paintings, Writing and tagged acrylic paintings, acrylics, Ballerina Twirling, ballerinas, ballet, Degas, Degas Copies, Edgar Degas, Gothic ballerinas, Gothic Ballerinas #2. Bookmark the permalink. 6 Comments. Quite lively and full of life, which is great! I love working fast sometimes for that reason. Thank you so much. And yes, I agree! I seem to do it more with acrylics than watercolors for some reason! Nice Patsy. I love the yellow too! Thank you, Jill! This one was really fun!